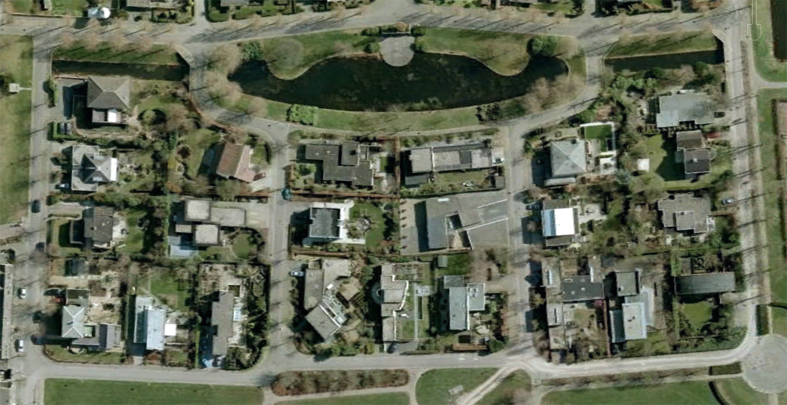 Near the Amersfoort district of Kattenbroek on the rim of the earlier Zielhorst overspill area is this villa district of 42 plots. To interest buyers in a house designed by front-line Dutch architects seven model villas were developed in maquette form. The built results illustrate the range of ideas, from the anthroposophical buildings of Alberts & Van Huut to the frozen simplicity of Arets & Van den Bergh and Mecanoo's studied modernism. Also worthy of mention is Rudy Uytenhaak's villa in specially shaped bricks. Projects: P. Blom (Haussmanstraat 22), Van Berkel en Bos (Alvar Aaltostraat 4), R.H.M. Uytenhaak (Haussmanstraat 20), C. de Weijer (Mecanoo) (Le Corbusierstraat 14), Arets & Van den Bergh (Le Corbusierstraat 16), M.A.A. van Schijndel (Le Corbusierstraat 12).